Dower chest carved 1917 for Alicia Jane Whitesides . Who was Nellie Payne? Dower chest for Alicia Jane Whitesides. This is a dower chest which was carved by Nellie for Alicia Jane Whitesides who was born in 1849 and died in 1940. Alicia was Marie’s paternal auntie and sister of Edward J.C. Whitesides who had married Nellie’s sister Sara Jane Field. 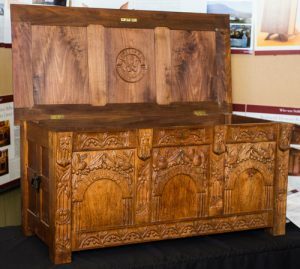 This chest has been handed down through the Whitesides family to Joan Whitesides (married James Graney) whose son David has kindly loaned this piece for the exhibition. Research from “Ellen Nora Payne – Woodcarver of Tasmania” by Russell Atkinson says that Nellie carved two chests for the Whitesides – one for Marie and one for Laura. However the Graney family hold the chest that was carved for an Alicia Jane Whiteside and this is what was displayed. At this stage we don’t know whether Marie or Laura were incorrectly listed or whether there was a third chest carved for Alisha. We may never know.